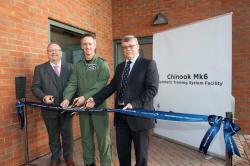 Paul Livingston (left), VP and group managing director, Lockheed Martin; Group Captain Lee Turner, RAF Odiham station commander; and Jon Haiselden, head of air systems, equipment for DE&S cut the ribbon at the RAF Odiham Chinook Mk6 training facility. Odiham, Hampshire, Nov. 21 2018 – A new training facility was opened with a ribbon-cutting ceremony at Royal Air Force (RAF) Odiham. 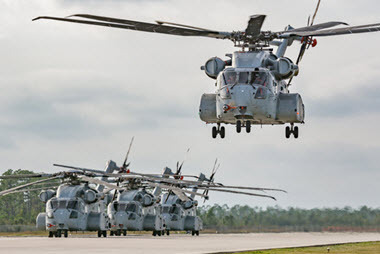 Delivered by Lockheed Martin (NYSE: LMT), the Synthetic Training System facility provides the Royal Air Force with leading simulator technology for pilots and crews training to operate Chinook Mk6 aircraft as well as classrooms, mission planning and brief and debrief rooms. In 2015, Lockheed Martin was awarded a contract by the UK Ministry of Defence to design, build and manage the facility, as well as introduce the training system for the Chinook Mk6. An integrated team consisting of Lockheed Martin and Inzpire personnel deliver a support package including maintenance and instruction at the RAF Odiham training facility.